FEZ - a puzzle game developed by Polytron Corp. Designed by Phil Fish. Released on Xbox Live Arcade intially and later on on the PC. The development of FEZ is partially captured in 'Indie Game: The Movie'. You Play Gomez, a critter living in a 2D world that goes on a bit of a 3D adventure because of the Hexahedron scattering cubes around that Gomez has to collect in order to avoid complete and utter destruction of all that is known. The cool thing about this game is that it uses 2D in a 3D world where the perspective makes moves and jumps possible that would otherwise not have been. This is done so by eliminating 'depth' or the Z-axis competely. This is NOT a real review but just me trying out the game. I recommend getting this on the PC as the XBoxLive version doesn't seem to get any updates to bugs (or it did corrupt a save file in the past) whereas the PC version does get frequent updates! Yes, the 1986 Intellivision game, Hover Force, can now be played while viewing it in its original 3D, just by using a simple Crayola toy. Check out the video overview and the links below for more details! Click here for the original AtariAge forum topic discussing the discovery. Click here for the full YouTube video for Hover Force for Intellivision. Click here for the Hover Force Wikipedia page. Click here to purchase the Crayola 3D Chalk with glasses from Amazon (just one of many options to get the required glasses). The next chapter was on Character Animation, and the author pointed out two different people-making tools you can use. Both were free in terms of cost: Make Human and Daz Studio. While you can try to make humans from scratch, these tools essentially give you an interface similar to those seen in games like Skyrim where you can adjust and tweak your face, nose, etc. The exciting part is that you can export your creations into Blender. I may know next to nothing about modeling and animation, but even I can use these interfaces and my combat mode looks a helluva lot more feasible. Spent most of today working my way through the Blender book and hitting some of my Unity books. I'm really starting to enjoy working with Blender; the book has been fantastic, and although I still feel like I'm muddling my way through, I already feel less like a drunk driver and more like an eager 16-year working on his learner's permit. I'm constantly seeing things in the book and realizing I've been doing so much stuff the HARD way, but if you put the book down for a minute you've already forgotten the shortcuts and have to dig through it again. Still, once you realize there's an easy way to do something, at least you know it's there for the digging up. One thing I didn't work with before was the modifiers you can apply to objects. Much like filters with Photoshop or GIMP, you can do a lot of nice art just by applying these tools (no actual artistic talent required). 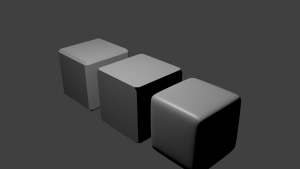 Three Cubes: Applying some simple modifiers makes each one look different. There's also techniques to quickly create four table legs and such. It's not quite as easy as just copying and pasting, but a helluva lot easier than trying to create four different ones and move them into place by hand. That's a nightmare. There's a viral video going around featuring some clever 3D effects on classic paintings. It's pretty funny, and has me wondering about the potential of 3D a well as ideas for fun video effects. Exclusive Interview with John Romero: Full Audio! John RomeroHere it is, folks, the audio from my 2-hour long interview with superstar developer John Romero. Although you can't hear my side, you won't have any problem following the conversation. The bulk of the conversation concerns Romero's personal history from childhood through Daikatana. You'll hear about the development of Commander Keen, Wolfenstein 3D, Doom, and Quake. Romero also discusses World of Warcraft, Star Trek, women in gaming, and plenty of other topics. Enjoy! Note: It's a 90 megabyte file, so you might want to right click above and save as. The videos are below for your convenience. After watching Avatar in 3D, I've been thinking off and on about how this technology could apply to gaming. Would those 3D effects make a game more immersive, or just be another gimmick? "Roll up, roll up, see the amazing Tyrannosaurus Rex, king of the dinosaurs, in his lair." Of all the things you might expect to find running on a ZX81 in 1981, a real time, first-person, 3D maze game would probably be somewhere near "impossible" on your list. Yet, that's exactly what Malcolm Evans was able to pull off--basically in his spare time, as little more than a diversion for himself. Nevertheless, Evans' tinkering became one of the most celebrated games for the ZX81 and a forerunner of the modern first-person game.